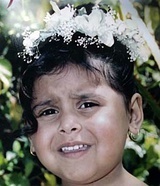 Posted May 30, 2014, 9:57 a.m.
Kaitlyn Avila, a 3-year-old Latino female, died Sunday, Sept. 24, after being shot in Baldwin Hills/Crenshaw, according to Los Angeles County coroner's records. Do you have information to share about the life of Kaitlyn Avila? The Homicide Report needs your help. E-mail us at homicidereport@latimes.com.